I used almonds in three different ways in my version – raw almond, almond milk and most important the mighty almond butter – giving a naughty twist to the classic carrot cake recipe. This particularly nutty take gives the whole cake a richer flavour and accentuates how moist a mouth-watering carrot cake should be. In other words, this is where my nut obsession and the essential carrot cake meet. Nevertheless, the key elements of an authentic carrot cake are still present and very potent. You get all the fresh shredded carrots making the cake unbelievably moist, not to mention that the spice blend, especially cinnamon, will warm up your palette right away. While the lower sugar take on the iconic cream cheese frosting will round everything out with just the right amount of added sweetness. As you can see, I tried to keep the frosting as light and thin as possible to create a “naked” style. Line two 8 inch cake pans with parchment paper. Set aside. In a mixing bowl, thoroughly sift in and combine flour, baking powder, baking soda, cinnamon, nutmeg, ginger, and salt (i.e. everything listed under dry ingredients). In another mixing bowl, using an electric beater, beat sugar, oil, and almond butter at medium speed until well combined. Add eggs, one at a time, to the mixture, and continue to beat at medium speed until well incorporated. Add almond milk and vanilla extract to thin out the mixture. Finally, gently stir in grated carrots and almonds. Add the prepared dry ingredients into the mixture in three batches. Stir gently with a spatula to combine everything until no flour can be seen. Avoid over-mixing. Pour the mixture evenly into the two prepared cake tins. Tap the pans several times to break any air bubbles. Bake for 30-35 mins, or until a toothpick inserted in the cake’s centre comes out clean. Cool the cake for 30 minutes in their pans, then take them out and put them onto a cooling rack to cool completely. While the cakes are cooling, prepare the cream cheese frosting. Using an electric mixer, beat the cream cheese and butter (at room temperature) at medium-high speed until smooth. Slowly add in the sifted icing sugar using a tablespoon, and beat until smooth. Add almond milk, vanilla, and salt, and beat until light and fluffy. Refrigerate the frosting for at least 1 hour to get firm so as to hold its shape while you work on it later. Level the cake layers by slicing the top curve of the cakes with a sharp knife to achieve a flat surface. Peel the parchment paper from the base of the cake layers and place one layer onto a plate or a cake board placed on a revolving cake stand (if you have it). Now we do the crumb coat first. Put a generous amount of frosting on the middle of the cake layer. Using an offset spatula, spread the frosting carefully and top it with the second cake layer. Frosting the top and sides of the cakes. Get a nice, smooth coat of icing with a bench scraper or a spatula. Put the crumb-coated cake in the refrigerator for an hour to get the frosting nice and firm. Once the cake is chilled (the frosting should be dry upon touching), frost your cake evenly with another layer of frosting using the same method. Get rid of all the peaks and blemishes in the process. Transfer the remaining cream cheese frosting into a pastry bag tipped with a simple round tip. 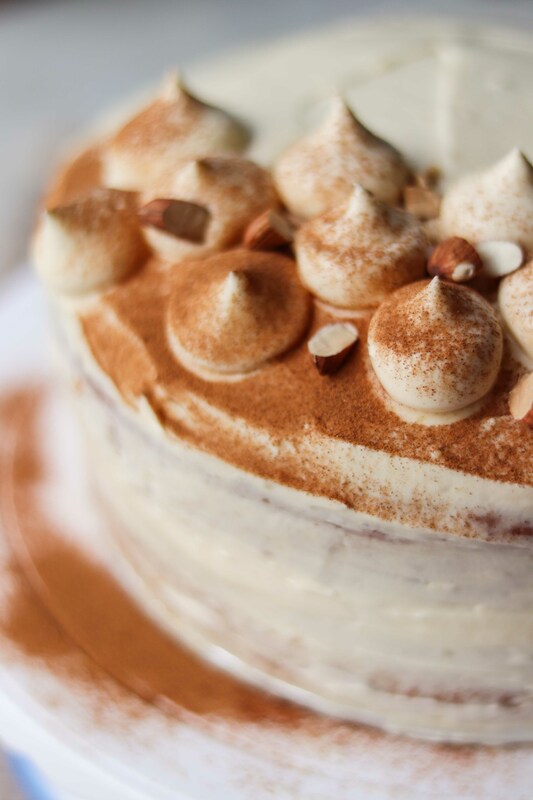 Pipe dollops of cream onto the cake, sprinkle ground cinnamon and a few almond pieces as garnish if desired. Refrigerate to let the cake set for at least 1 hour or overnight. Enjoy! Roast 200g raw almond in an oven at 350F (175C) for 10 mins. Blend or process the roasted almond until completely smooth and creamy. Add honey, cinnamon and salt, and process until well combined. What a beautiful cake! I would love a bite! These photographs are gorgeous! I would love to try this if i wasn’t on a student budget haha!